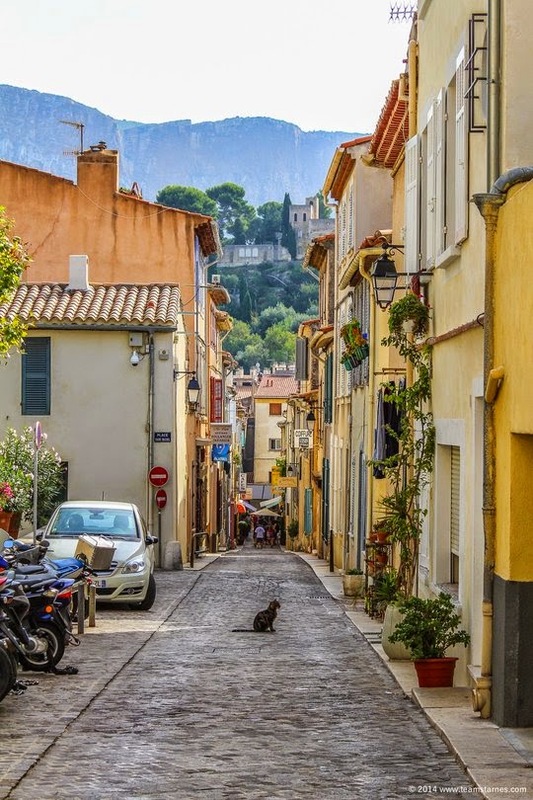 This kitty was found meandering through the winding streets of Cassis, a picturesque coastal village in the south of France. Cassis is only twenty miles east of Marseille and very much worth a visit. This looks like something straight out of a painting. I love it! As a Brit I can't really compliment the French but that does look like a very nice town and of course a lovely little kitty. If I was to visit France it'd probably just be the north or central areas. I love the composition. So much happening around it, and yet the eye goes straight to the lone kitty. Cassis looks to be a wonderful place to wander round - we hope the cat has a loving home. Nice photo ! I love this place in the south of France. Have a good day, Vanessa. What a lucky kitty to live in such a pretty place. Kitty OWNS the road. GET OUT OF MY WAY! Maybe that sweetie is waiting for dinner delivery! What a picturesque scene. You got a great shot there. Thank you for sharing it. I once visited Marseille but I don't think I got to visit Cassis. Would love to go there some day. Gorgeous photo and man is that cat lucky to live there! Wow what a beautiful street! It almost doesn't seem real. The kitty just adds to the beauty of the photo. That is a very lovely photo!! Il y a tellement de jolis villages ensoleillés dans le sud. Les chats sont leur âme. What a beautiful village! Sure do hope that that kitty's peeps live in one of those homes and that he or she is just out for a stroll. Love the photo. Makes me want to visit. I like how he is just sitting there like he owns the place. A beautiful little village .. Reminds me of something out of a wonderful child's story. With an adventurous kitty as the hero. What a lovely photo! It does look like a painting as CK said! What a great photo....very colorful - well "framed" and that cat looks like the King of the Road!! I love this photos would easily be a poster!!! Thanks for stopping by this week!! That's a nice photo and the lone cat heheh! Beautiful. Can you imagine living on a street that narrow? I would totally get a moped. I so enjoy looking at all of the architecture and surroundings of all your "traveling cats." I've never been anywhere of the North American continent, so it's always nice to see these awesome photos. And of course, the cats make them so much cooler!!! Une jolie vue, bien colorée ... mais le sujet important, c'est le chat ! What a charming photograph - I love it! Look out! Cat in the road! What a scenic place for a kitty to live. I hope kitty is well cared for. What a fabulous photo! Sounds like a lovely place to visit. Lucky kitty! That really is such a great picture. Love the cat looking for a nice meal. Thanks for visiting our blog. Wow that photo is amazing!! Thanks for sharing!